A few weeks ago we asked you to send in your look-alike photos and the response has been amazing! We want to thank all of you who submitted. It was great to see uncanny family resemblances between the generations. With so many photos submitted from around the world, it was really difficult to choose a winner. 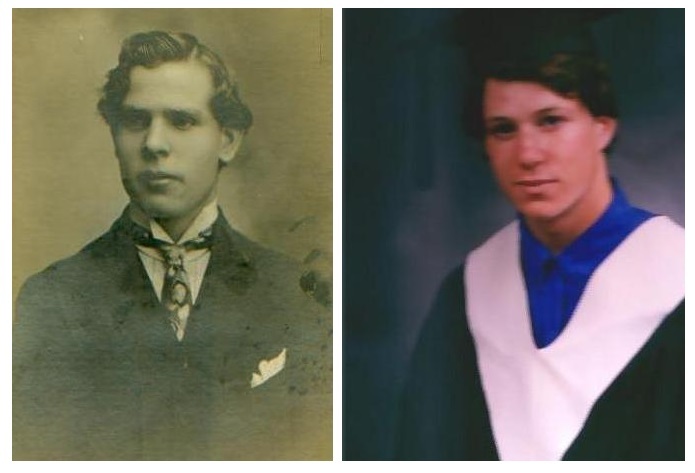 But without further ado, we’d like to wish congratulations to Sheila Van Zant who sent in these incredible look-alike images produced 200 years apart! Here are some more of our favorite photos from around the world including Sweden, the Netherlands, Brazil, USA, Australia and Germany. There are lots more photos that we couldn’t include in one blog post. Check our Pinterest album to see all the amazing entries. Photos (and other images, such as paintings) capture the essence of people, places and things and are among the most desirable of family history treasures. An old photo can tell a family story and teach you about the lives of your ancestors. Have you learned any stories through your old family photos? Let us know in the comments below! What a wonderful idea, and how much some of them look reincarnated if you believe in that sort of thing. What fun – great idea – thanks for sharing – enjoyed it a lot – thanks! Amazing look a-likes and I enjoyed them all. I don’t think your number one pick look very much alike. Takes a stretch of imagination. There are some truly amazing lookalikes here! I don’t think your number one pick look very much alike either. Others look more alike than the number one pick. My vote would have been for Jackie and Caroline or Olaus and Max. These are remarkable photos. So many generations separate some of them and they still look so alike! Keep showing them to us please! Enjoyed looking at these photographs. If seen under other circumstances one could say they were the same person! these folk are so lucky to have photos of relies. i cant find any records on my paternal grt/grandmother after 40ys searching. On the news recently showing Waterloo bicentennial celebrations, I was staggered to see the facial resemblance between Napoleon’s descendant and his forebear. Although the younger Napoleon is a lot taller, their features were uncannily alike. I absolutely lookalikes in families. Really enjoyed it. Although my choice for #1 would differ greatly from that selected, I really enjoyed viewing the matched duos. I am a distant Cousin of the famous WWII Journalist Ernie Pyle. 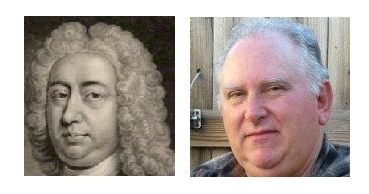 We are each descended from two Brothers who emigrated from England in 1683!! That is where our lines split off…and yet there is STILL an amazing Family resemblance after all these centuries! Same build, same coloring, same ears…and last but certainly not least…what we in the Family still call ‘The Pyle Chin’. To be honest, I think your number 1 is the least like his ancestor of them all, some of which are the spitting image of their ancestor. All excellent-my choice is Michelle & Lucy for looking not only so much alike but also for having the same beautiful smiles – and what a modern looking great – grandmother ! The baby pictures of my son and his daughter, and my grandson and his daughter leave no doubt they are related! I love the look a like photos! We have them in our family! 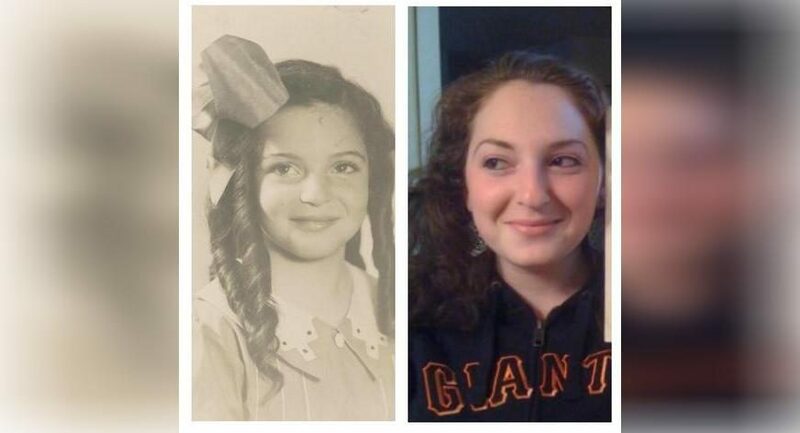 My grandmother and her mother look so much alike that as a child, I thought that a picture of my great grandmother was my grandmother. 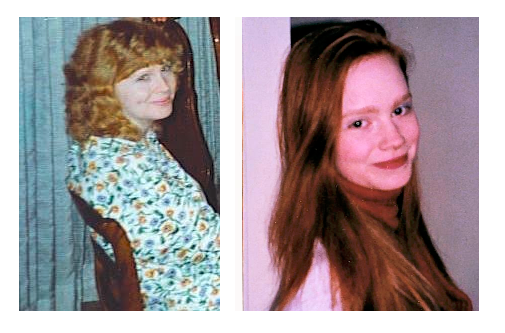 Also, if you looked at pictures of my oldest sister, myself, and my daughter together, if they weren’t from different times and photo quality, you would think they were the same baby! I loved the look alike photos but I think number one wasn’t as good as most of the others, especially the granddaughter and grandmother! Always wondered who my brother looked like. He looks like my fathers uncles. 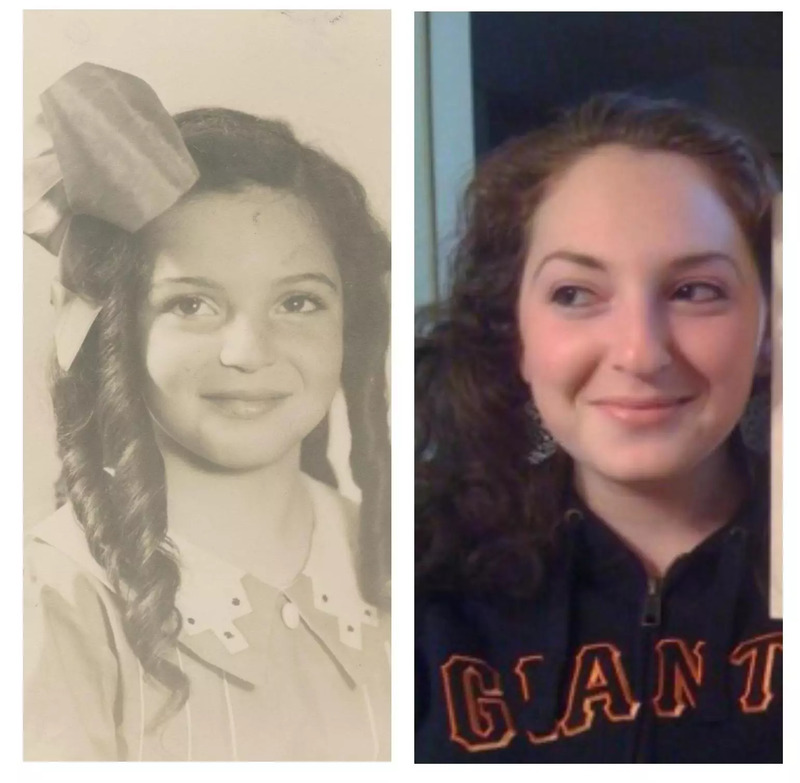 I have a picture of an ancestor that we are not sure how she is related and my niece that have a very striking resemblance. These photos are stunning. 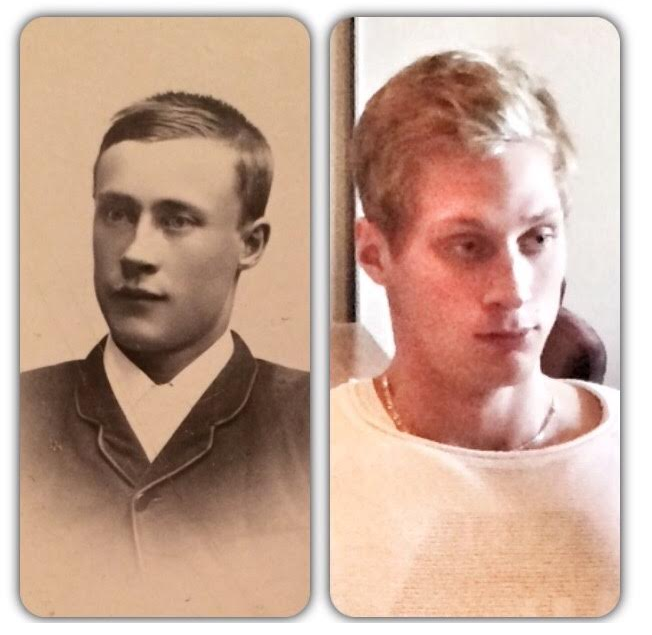 I have a first cousin`s son who is the spitting image of my great grandfather. Looking at these photos shows me just how strong the genes are. I am fortunate to have some original photos and researched information. It is amazing how family likenesses and traits follow through from generation to generation. The photos shown are fascinating. No 1 look nothing like each othe winners should have been Caroline and Jackie or the two little boys but lovely pictures and very interesting as well thankyou for sharing them. 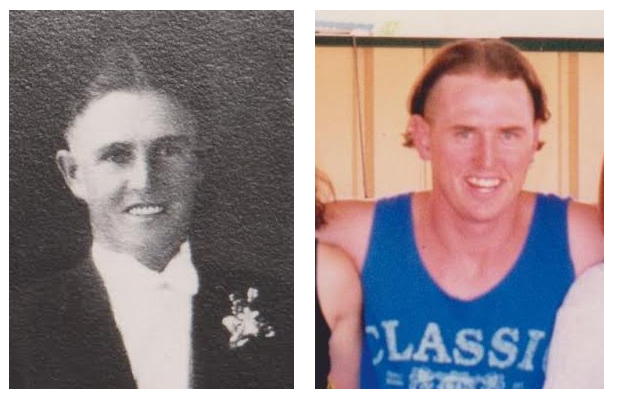 I used to say that my brother looked just like our grandfather, but no one believed it until I did side by side photos of them, and threw in a photo of our gg-grandfather as well – they could have been triplets! Great idea, what fun. To be honest I didn’t think the winners looked like and, taken feature by feature, only the double chin matched – perhaps it was the Viscount bit that appealed. However, all of the others were great – and even some of the personalities seemed the same. In 2013, I received a photo from my cousin of my Grandmother on her wedding day in Indonesia, 1904. It is astounding how much I look like her. A striking resemblance. I would love to submit a photo. I came here because I find it weird how resemblance and traits in apperance travels or not through generations and how they intersect even though they shouldn’t. Oftentimes you see someone looking like their aunt or greatgreatgrand-uncle or third cousin. I guess the traits (?) leaps through generations so that they keep appear randomly rather than stay intact all through the years. What’s weird is how there are traits in my mother and her grandmother that looks like noone else in the (Swedish) line of faces, but exactly like stereotypical Maroccan Berber women, my mom always felt a bit different-looking but jokes about her ancestor being abducted by Vikings in Marocco a thousand years ago. When I see pictures of Berber women I see the significant traits of my mum (like the way she smiles, her neckline, her lilac-hued lips, a glimpse in the eye) that I never see in anyone but my mum in these random stranger Berber ladies! It’s so weird. (this family have been living in a remote place for hundreds of years. ) Even if this or something like it was actually the case, how could traits possibly travel through like 35 generations? I dig the pics,makes me even more curios about relitives!! !